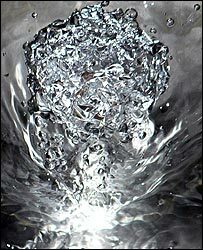 A photograph of a ball of tin foil dropped into a pan of water has won this year's BBC News website Mock Turner competition. Foiled, by Matthew John, beat 11 other entries in the poll of 22,973 readers, receiving more than 18% of the votes. Mr John, from south London, said his inspiration was making "everyday things looking unusual". More than 300 people entered the competition, staged ahead of Monday's official Turner winner announcement. BBC arts correspondent David Sillito, who judged the entries, said Foiled "makes you look and it makes you think". "It could be a science experiment, a mushroom cloud, or what it is - a bit of tin foil," he said. Mr John, a 32-year-old writer, said he had only been using a digital camera for "three or four months". "It's fun to take pictures of splashes, drops and water generally," he said. "I was searching the flat for something to drop in a pan full of water, something to make a splash, and came across a roll of tin foil. "I thought that the foil under the water could make a better picture than the splash above the water so I took it and flipped the image 180 degrees." Mr John said he had previously placed the image on the Flickr photo-sharing website and had forgotten about it until he came across details of the Mock Turner competition. Foiled was the narrow victor, beating Wendy Asprey's second-placed sculpture of children's dummies, entitled Out of the Mouths of Babes, by less than one per cent. Judge Sillito called the work "funny, bleak and startling". The entries were whittled down to a shortlist of 12 entries. The bottom six after the vote were What do you See by Adam Grose (7.7%); Cat on the Rails by John Stanford (6.8%); Actor by Jeremy Cloot (5.8%); A Bigger Wave by Eddie Edmundson (4.2%); General Carbuncle by James Ford (1.9%); and Panic by Martin Hay (5.8%). The official Turner Prize winner, from a shortlist of four artists, will be unveiled in a ceremony at Tate Britain beginning at 2130 GMT. The nominees are installation artists Simon Starling and Jim Lambie, painter Gillian Carnegie and Darren Almond, whose work includes photography and video.